Canada’s prosperity depends on Canadians having the skills, training and experience they need to get good quality jobs and succeed in a changing economy. To help meet the increasing need for more workers in the trades, the Government of Canada is taking a leadership role by introducing new initiatives to encourage women to enter and succeed in Red Seal trades where they are under-represented. Today, the Honourable Patty Hajdu, Minister of Employment, Workforce Development and Labour, announced that the Apprenticeship Incentive Grant for Women is now available to eligible apprentices. The new Apprenticeship Incentive Grant for Women provides $3,000 per year or level, up to a maximum amount of $6,000, to registered apprentices who have successfully completed their first or second year/level of an apprenticeship program in eligible Red Seal trades. This, in combination with the existing Apprenticeship Completion Grant valued at $2,000, could result in combined grant support of up to $8,000 over the course of their training. Women apprentices who progress in their training on or after April 1, 2018, may be eligible for the new grant. Applications are available online by visiting Canada.ca/apprenticeship-grants or call toll-free 1-866-742-3644 (TTY: 1-866-909-9757) to request an application form. The new Apprenticeship Incentive Grant for Women supports gender equality and better economic outcomes for women by giving them more opportunities to access typically higher-paying Red Seal trades where they are under-represented. Approximately one in five employed Canadians are represented in the skilled trades professions. At the end of 2017, there were 309,441 registered apprentices across Canada (2017 Registered Apprenticeship Information System). Women account for nine percent of apprentices in Red Seal trades, and only five percent when “traditional” trades (hairstylist, cook and baker) are removed (2017 Registered Apprenticeship Information System). The Government of Canada is investing almost $20 million over five years to pilot the Apprenticeship Incentive Grant for Women. The AIG-W is one of several Government of Canada initiatives to support women and other groups who face barriers to entering and succeeding in the skilled trades, including the Women in Construction Fund and the pre-apprenticeship program. The voice of B.C.’s unionized construction sector lauds the decision today by the B.C. NDP government to move forward with the Site C hydroelectric dam. Sigurdson hopes the government will put in place measures to increase the number of local workers hired, support apprenticeship opportunities on the project and create opportunities for First Nations and women. Tradespeople at Seaspan’s North Vancouver shipyard are facing the possibility of major layoffs after the company announced that a gap in construction of new federal non-combat vessels is coming next year. There are currently 600 tradespeople working at the yard. Laid-off workers would be hunting for new jobs at a time of high demand for trades workers in B.C.’s construction sector. “Most DC38 construction members are aware of their Market Recovery (MR) deductions, and some grumble about this,” according to Dave Holmes, Business Manager of District Council 38. “All too often though there is little recognition of the program’s benefits for both fellow members and our contractors,” he says. The Market Recovery Fund was created on May 11, 1997, when in response to a shrinking contractor base and too many unemployed members, Painters voted at a special meeting to establish the program. “At the time non-union competition was putting us out of business, quite literally,” says Holmes. “Our employers were losing their long term clients and the wage gaps, up to 50%, were making us uncompetitive. Our choices at the time were to either slash the Agreement or try to gain work through the implementation of Market Recovery”. Don Bauer is a DC38 Painter in Victoria who says he has worked on as many as 40 or 50 Market Recovery jobs in the last twenty years. “I was there for the 1997 vote with Brother Holmes and I voted in favour of setting up the fund,” says Don. been able to elevate, and continue to promote, a high standard of skill in its chosen professions. 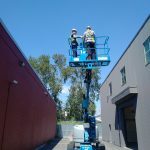 The Union has done this in conjunction with the development of its training facility, the Finishing Trades Institute of BC. Peter Wilson moved to BC from Toronto in 2008 when he joined the Union for work as a Commercial Painter. He thinks that the MR program makes good sense. An analysis of the 2016 results, for both the Painting Industry Advancement Fund (PIAF) and the Wall and Ceiling Industry Advancement Fund (WCIAF), shows that the programs generated 172,500 member hours, or the equivalent of 83 full-time jobs. Those 172,500 additional hours generated just under $7 million in additional wages and benefits to DC38 members. Given that the cost of the fund was about $530,000, Market Recovered projects resulted in a thirteen-to-one return on every dollar paid out. Jim Ewing is a DC38 Lather with 42 years of experience and says one in every three jobs he has worked on in recent years is the result of MR support. “Ninety-nine percent of our members only see the MR as a deduction, but it is essential if our contractors are going to compete with the non-union operators,” says Jim. “And what doesn’t show up in the MR statistics is the additional jobs handed to us because we are on-site and the client gets to know us and likes our work. A lot of that goes on,” he says. Another member who benefitted from the WCIAF is Wayne Howatt who retired as a DC38 Lather last June. “I do miss it a bit,” he says. “Sometimes some of our members don’t see how tough it is to compete with the non-union sector. Our benefit package is worth $5 an hour and when added to the wages it can mean a non-union Lather is being paid $25 an hour while we are at $40 — that’s a big difference,” says Wayne. 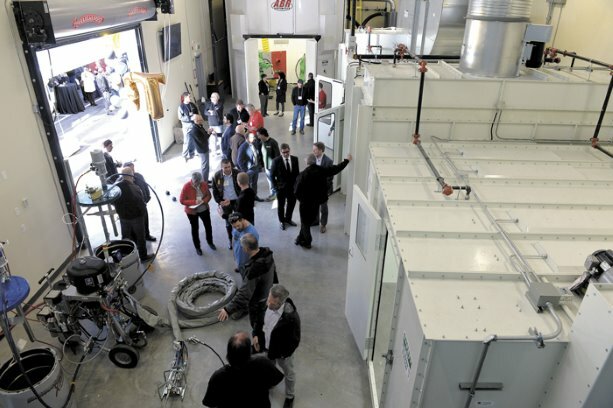 The new 14,000-square-foot addition to the Finishing Trades Institute of B.C. 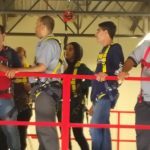 (FTI), which now has 40,000 square feet of training space for tradespersons, will provide space for two growing training needs. 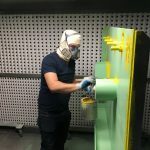 “Primarily, we saw a lot of work for industrial painting in the future and we had outgrown the facility we were in,” said Patrick Byrne, FTI director of training. Industrial painters deal with range of large industrial structures. “These are the guys you see hanging off a bridge,” said Byrne. They area also the individuals who paint fuel tanks, apply linings for penstocks on dams, work on pipeline or, in confined spaces. 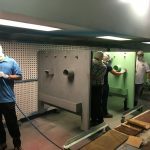 Industrial painting is a component of becoming a Red Seal painter. This week we have had the pleasure of welcoming some special new apprentices to the DC 38 family. Park and Derochie (Seaside), who is one of our largest Industrial Painting contractors, approached Painting Representative Justin Chapman, with a new and unique opportunity. 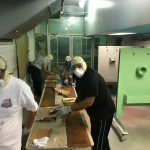 Through the BC Alliance for Manufacturing, Park and Derochie (Seaside), was able to identify former citizens of Syria who had worked previously in construction trades in their former homeland. These individuals were presented as hard working, honest and reliable people who were looking for an opportunity to prove their worth and to make a new life for themselves in Canada. 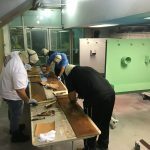 Seven individuals, along with their interpreter, Manal Nour, have spent the past week receiving their safety certifications, as well some hands on training in paint prep, in advance of their starting with our contractor on Monday. 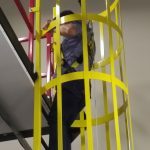 Both Safety Director Andrew Swan and Painting Representative Justin Chapman had some extremely positive things to say about the work ethic, and the ability to grasp information and retain it, that these individuals displayed. 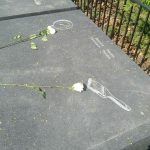 They also made mention of their gratitude, politeness and willingness to help one another with their assigned tasks. While walking through our facility, one of the Syrian trainees got extremely excited when he saw our Drywall Finishing students at work. It turns out that he had worked as a Drywall Finisher in Syria for 15 years. Being a member of DC 38, he will have the opportunity to move to the Drywall program if he so chooses at a later date. 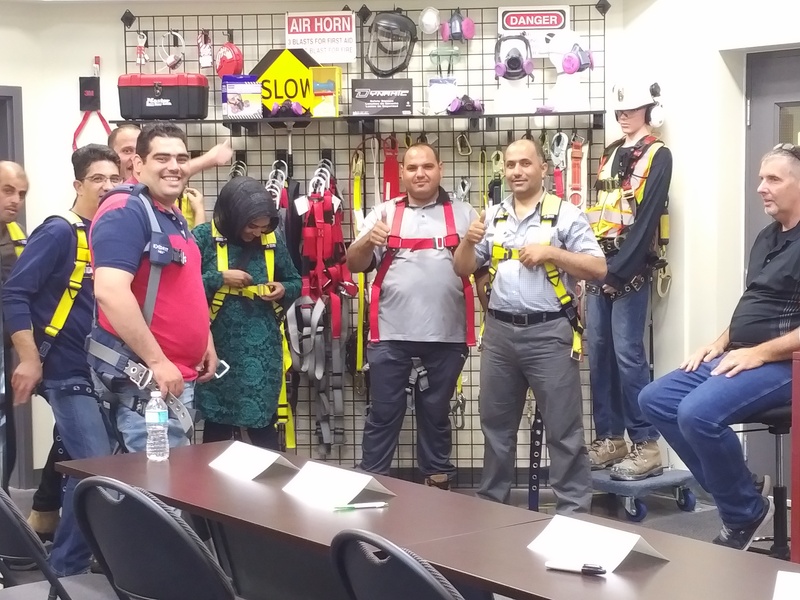 We will be exploring the possibility of bringing in additional Syrian workers in the coming weeks, as one of our Hazardous Materials Abatement Contractors, Enviro-Vac environmental, has also expressed an interest in giving these individuals an opportunity to work in the Hazmat field. 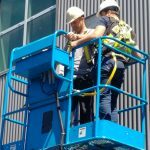 DC 38 and the Finishing Trades Institute of BC is proud to be involved in programs such as these. Apart from some language issues, we are certain that these new apprentices have all the tools necessary to succeed in our industries. We look forward to assisting more new immigrants in finding a better life here in Canada. Business Manager Dave Holmes A.K.A. Wayne Campbell and DOT Paddy Byrne A.K.A. Garth Algar. At the recent CLRA golf tournament, Business Manager, Dave Holmes, and Director of Training, Paddy Byrne, assumed their alter-identities as Garth Algar and Wayne Campbell from, Wayne’s World, in order to raise funds for research into Juvenile Diabetes at UBC. 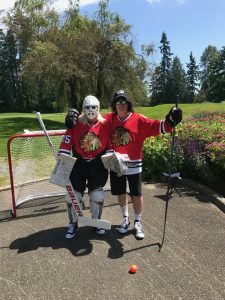 On a hot and sunny day which was perfect for golf, but less so to suit up in pads for hockey, Dave and Paddy asked golfers to take a turn matching their hockey skills against the formidable goal tending of Garth Algar. Each golfer, for the cost of $10.00, had three chances to beat Garth and be entered into a Draw for a Brand New iPhone and Apple Watch. There was also a last place prize, dinner with Paddy and Dave! At the end of the day $1,400.00 was raised, and apart from the numerous welts from hockey balls, (Garth wasn’t wearing upper body pads because of the heat) everyone seemed to enjoy the antics of our hockey playing heroes. Only 3 of the approximately 140 golfers were able to put all 3 of their shots behind Garth and he has the bruises to prove it. Thanks to everyone at CLR for putting on a great tournament and special thanks to the Vancouver Golf Club for allowing us to put on this event at such a pristine golf course. At the recent NABOC Conference held June 27 to 29th in Osoyoos, our newest Hazardous Materials Abatement Contractor, Stalkaya Environmental, made its latest pitch to First Nations business representatives with regard to it’s services as a Hazardous Materials Contractor, and as a conduit to opportunities for apprenticeship for Aboriginal workers through DC 38 and the FTI of BC. NABOC or the National Aboriginal Business Opportunities Conference, meets around the province of British Columbia in various communities in an effort to highlight and promote Aboriginal Business and opportunities for the public at large to become more aware of the great work being done by business people from First Nations communities. Stayalka Environmental is a joint venture arrangement where Enviro-Vac Environmental has entered into a partnership with majority shareholder Ray Natraoro, who is from the Squamish First Nation. 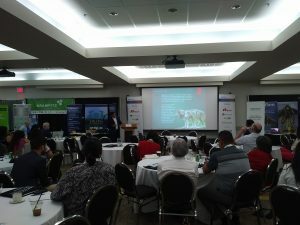 Ray was able to make a pitch, on behalf of Stalkaya, to over 200 business representatives from the Aboriginal community as well as others from a wide variety of backgrounds from all across Canada. Ray made the case that young people working for his company not only had the opportunity to make a good living with union wages and benefites as Hazmat Workers, but also had opportunities through Stalkaya’s partnership with our union, to receive Red Seal apprenticeship training in one of our 4 finishing trades, if they chose to go that route. There were several impressive presentations made at the NABOC and Stalkaya’s story, as told by Ray, resonated as impressively as those who had already been in business for years. This was a great opportunity to network and bee seen and Stalkaya made a great first impression at the Conference. 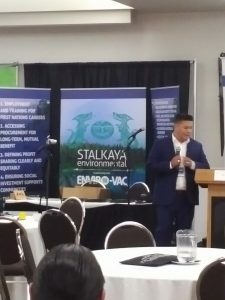 Delegates to NABOC Osoyoos 2017 listen to a presentation from Stalkaya Environmental. 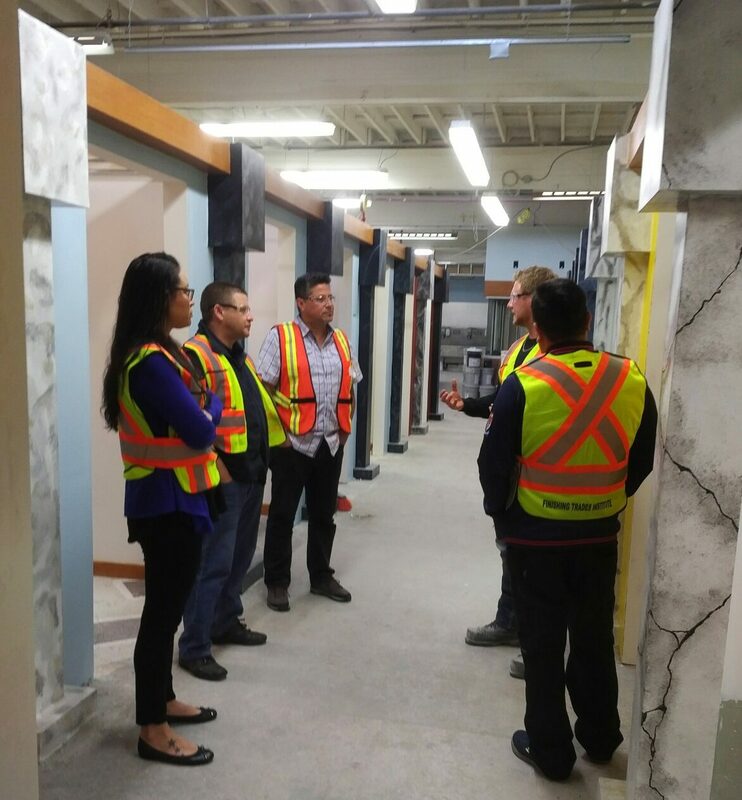 This week, the Finishing Trades Institute of BC, welcomed representatives from the Squamish First Nation, looking at ways our two organizations can work closer together. Amongst those in attendance were Peter Baker, who heads up the Squamish Nation Trades Training Centre, as well as Ray Natraoro, President and Director of Business Development for Stalkaya Environmental, one our newest hazardous materials abatement contractors. In addition to being the majority partner in Stalkaya Environmental, Ray is also one of the hereditary chiefs of the Squamish Nation, where he is known as Ses Siyam. Stalkaya is the first majority owned First Nations environmental company in the province, which is a great achievement. 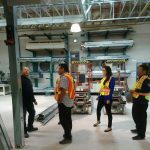 Our partnership with Stalkaya and their partner company, Enviro-Vac environmental, was a major driver in having the FTI look at ways to partner with the Squamish Nation Trades Training Centre. 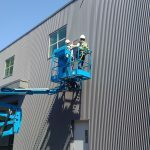 However, we have also been working with one of our signatory painting contractors, Done Right Painting, and the owner, Troy Halverson, in developing an introductory painting course that Troy is helping to deliver at the Squamish Nation Trades Training Centre. FTI painting instructor and coordinator, Chico Albino, assisted Troy with the development of course materials for this pilot program and according to the feedback we are getting, it has been well received. 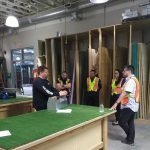 Director of Training, Paddy Byrne, visited the Squamish Nation Trades Training Centre the previous week and remarked on how impressed he was with the quality of the Squamish facility and with what they had been able to accomplish within their current space. There are plans for an expansion of the facility in the works. FTI Director of Training, Paddy Byrne and Peter Baker of the Squamish Nation Trades Training Centre, both see the possibility of our two facilities creating a path where First Nations people from across the Lower mainland, could successfully enter one of the Finishing Trades and achieve Red Seal status in their chosen craft. This would also be very beneficial to those contractors signatory to District Council 38 as we are constantly looking for energetic young people eager to make a good living and provide a better life for their families. This could truly be the beginning of a mutually beneficial partnership where all parties need are met. 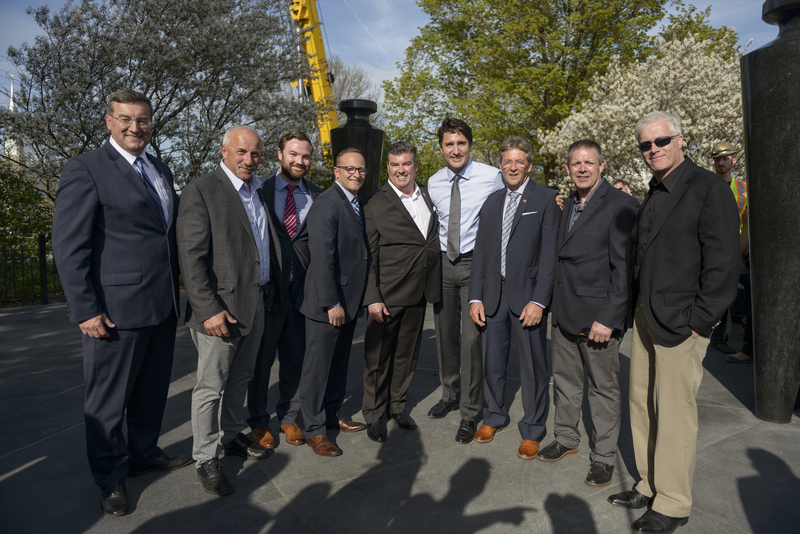 The week of May 14 was an important one for Unionized construction workers from across Canada, as the Legislative Conference of the Canadian Building Trades was back in Ottawa for our annual opportunity to lobby on behalf of our members. Meetings were held with representatives from the New Democratic, Conservative and the governing Liberal Parties, in an effort to advance the interests of Union Trades workers from all of the construction crafts. 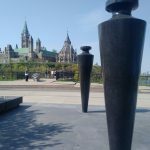 However, probably the most significant piece of business that was conducted during this conference was the unveiling of a brand new Monument on Parliament Hill. 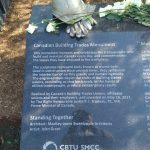 This monument is dedicated solely to Union construction Trades workers, in recognition of our all of our contributions to the growth of our communities, not just as builders of buildings and infrastructure, but as an integral part of the fabric of Canada itself. 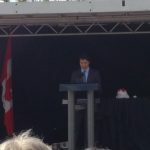 We were especially pleased to have the Prime Minister of Canada, Justin Trudeau, on hand to help with the official opening of the monument. The Prime Minister spoke at length about the value the 500,000 members of the Canadian Building Trades bring to the lives of all Canadians. It was refreshing to hear our Prime Minister speak without hesitation about his respect for Union construction workers and the integrity of the apprenticeship programs that we oversee. 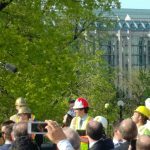 To give you a sense of just how important this occasion was, most of the General Presidents of the major North American Building Trades Unions also attended this event. The monument is the first in all of North America dedicated specifically to Union Building Trades and the General Presidents wanted to be in attendance on such a momentous occasion.